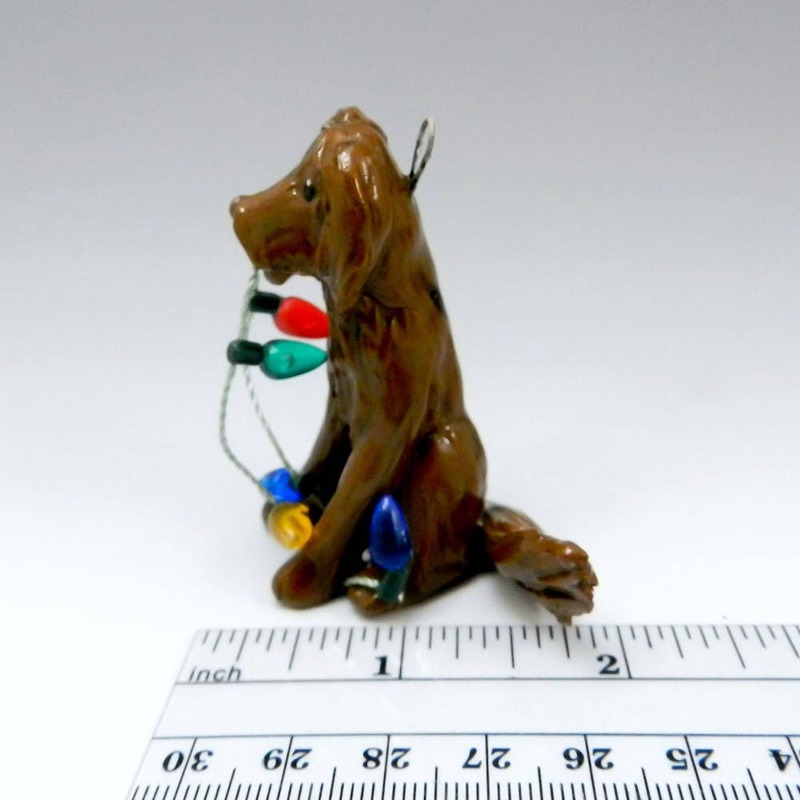 Liver brown Flat Coated Retriever Dog Christmas Ornament Figurine playing with a string of colorful Christmas lights (lights do not light up). * Approx. 2 1/4" high x 1 1/2" wide. 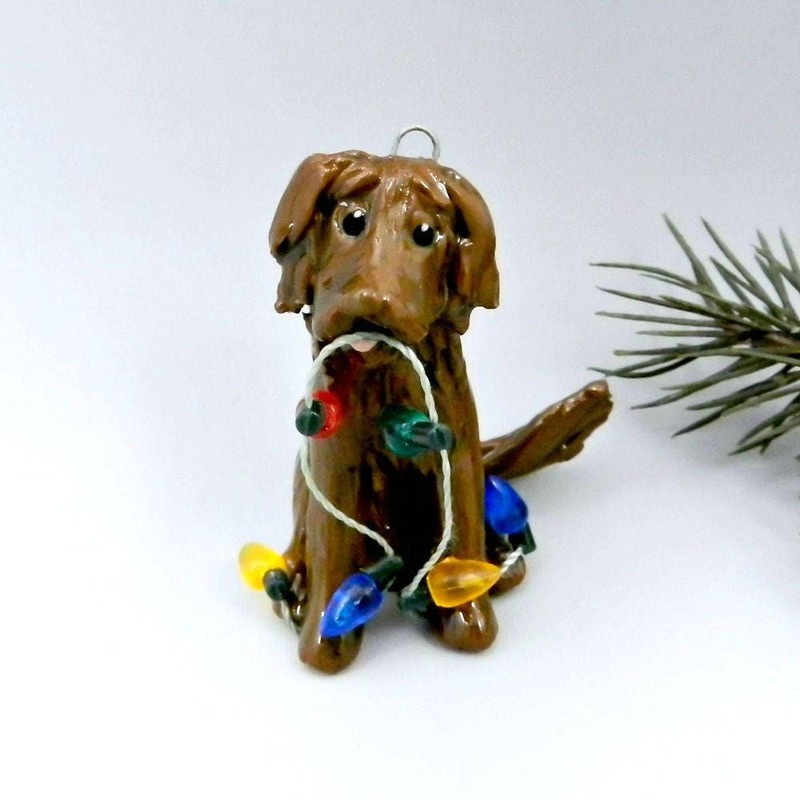 * All ornaments come with a gift box and a gold cord for hanging or can sit for year around display. * The item shown in the picture is the one you will receive. * Item is already made and ready to ship. a percentage of profits are donated to Animal Rescue! Although they are cute, they are NOT A TOY, not meant for children. All my works are my original designs. hand glazed, then re-fired to a fine porcelain china. 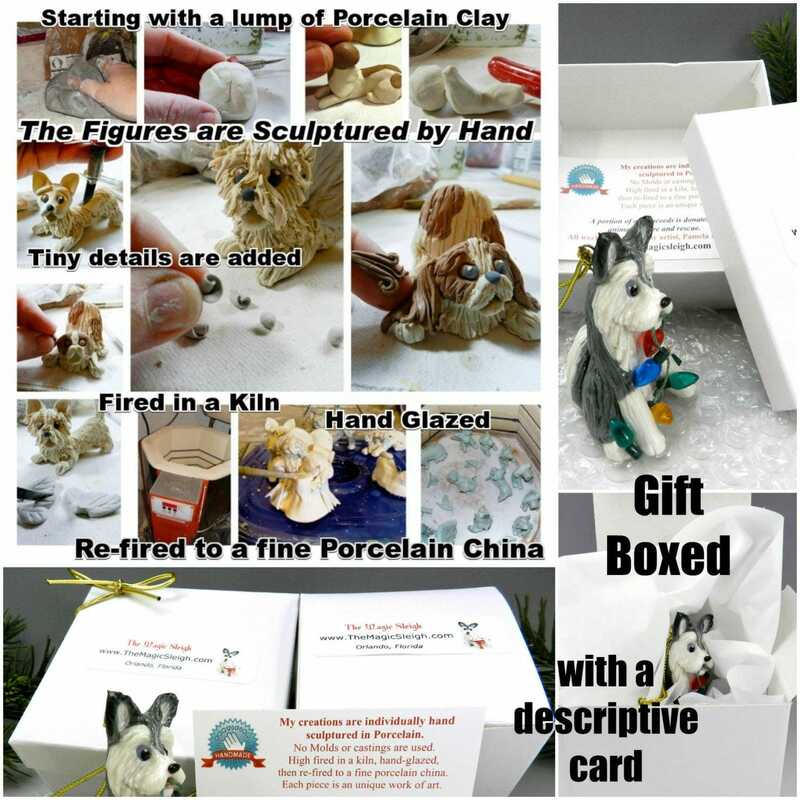 Working in Porcelain full time is what I do for over 20 years. Entirely handmade - truly One Of A Kind. INTERNATIONAL BUYERS, PLEASE NOTE: Item price does NOT include your country's VAT/GST; these amounts may be assessed to be paid by you at import. CUSTOMERS are responsible for paying all taxes/duties/fees, etc. that have to be paid before an item can be delivered. These charges are set by the buyer's country and are in no way linked to The Magic Sleigh. ** United Kingdom Customers- Please be aware that the UK charges 20% VAT on imports over £15 and the post office charges an £8 handling fee. CUSTOMERS are responsible for paying these fees. Shipping is combined when added to cart for same address! - Please allow the post office 5-7 business days before inquiring regarding non-delivery of Priority Mail packages and 10-12 business days for Standard Post packages. Weekends and holidays will significantly lengthen delivery time frames. 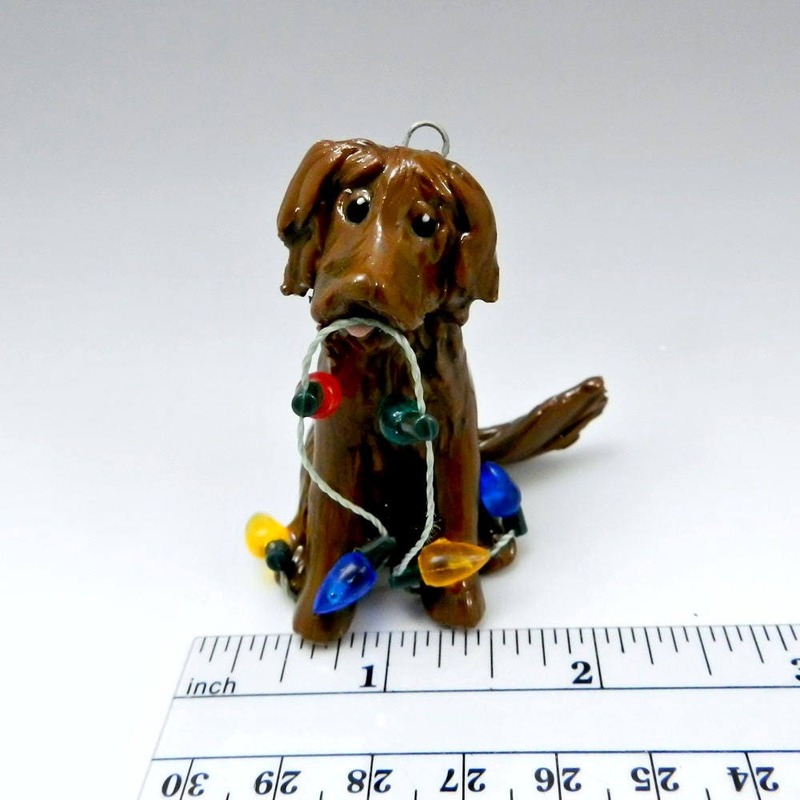 Shipping around any holiday can be very unpredictable and may significantly delay delivery. USPS, as per their website, does not consider a package lost for at least 30 days. Please allow the post office 20 business days before inquiring regarding non-delivery of packages. Please note that postal carriers do not guarantee delivery time frames. International CUSTOMERS are responsible for paying all taxes/duties/fees, etc. that have to be paid before an item can be delivered. These charges are set by the buyer's country and are in no way linked to The Magic Sleigh. *Please note: due to difficulties in the past I will no longer ship to Africa or certain Middle eastern Countries unless by prior arrangement as it is just too disappointing for both of us if there are difficulties getting your order to you. Overseas customers, please allow up to 4 to 6 weeks for delivery. Many orders will arrive much sooner but overseas delivery times can vary a lot, so please be patient. If ordering for CHRISTMAS, I recommend placing overseas orders by NOVEMBER 1st IF POSSIBLE!! I want you to be a happy and satisfied customer. If you wish to return or exchange an item please contact me within 30 days of receipt of merchandise. Please make sure to contact me within 14 days from the date you received your items if there is a problem! All items can be shipped back to the return address on package. I carefully wrap and double box each item, but if one should arrive broken, please contact me before leaving feedback. If you have received an item damaged during shipment, please send photo proof (for insurance purposes) that the item was damaged and I will send a full refund if I do not have another similar, or if you can't wait for a replacement. I can not give refunds for packages being later than expected delivery, as I have no control over post office delivery times, USPS Priority and first class do NOT have guaranteed delivery times. I will accept a return, once it is received in the same condition as sent, I will refund. You may return within 7 days of contacting me and receive a refund, less original shipping charges. Return shipping is your responsibility. Please insure your return package as The Magic Sleigh cannot be held responsible for lost or misdirected mail on returned packages. For exchanges, shipping to and from The Magic Sleigh is your responsibility. If the error was on my part, The Magic Sleigh will bear the cost of shipping both ways! ©2019 Pamela Fleming - All work on this site is the work of Pamela Fleming. All work of art depicted in this shop are protected under U.S. copyright laws and international conventions. NO PORTION of the artist's work or statements may be used, downloaded, reproduced using any means, copied, linked to, or transferred electronically, without prior written permission from the artist. Please take this very seriously as I will seek to protect my work. Combined Shipping on multiple items? Shipping is combined when items from My Shop are added to cart for one address only, not for multiple addresses. Yes, I will ship as a gift to someone else as long as they are within the same country as the purchaser. If not Please contact me to set up shipping charges. Postage costs are to ONE address only. Will I have to pay Customs or VAT taxes on my purchase or are they included? CUSTOMERS are responsible for any CUSTOMS OR TAX CHARGES that have to be paid before an item can be delivered. These charges are set by the buyer's country and are in no way linked to The Magic Sleigh. ** United Kingdom Customers- Please be aware that the UK charges 20% VAT on imports over £15 and the post office charges an £8 handling fee. Buyers are responsible for paying these fees. I am not currently accepting new custom orders. 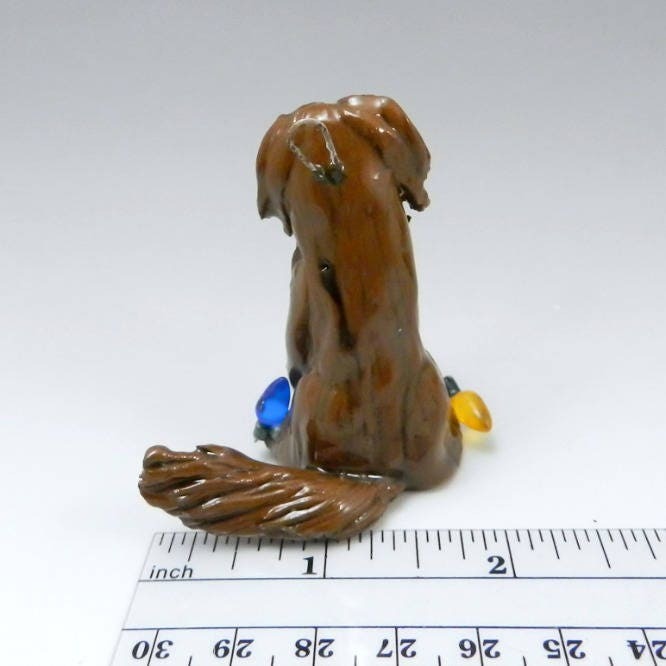 Please see my website for a full list of breeds and colors I make.